Lucknow Bench of Allahabad High Court dismissed a PIL which sought for quashing of Justice Vishnu Sahai Commission report on the Muzaffarnagar Communal Riots that occurred in the year 2012. The Division Bench also refused to hand over investigation about the riots to Central Bureau of Investigation. The Bombay High Court on Friday observed that no law bars entry of women in places of worship, and hence no gender discrimination in this regard should be tolerated. “Ultimately, it is the fundamental right of a woman and the government’s fundamental duty to protect their (women) right,” the Bench Quoted. A Delhi High Court Division Bench con Wednesday, disposed off the petition seeking stay on the release of BomanIrani, Veer Das-starrer ‘Santa Banta Pvt. Ltd’ and directed the Central Board of Film Certification(CBFC) to treat the petition as a representation. The High Court has observed that attitude of the courts of sending witness back by granting adjournments, is a major cause of harassment which discourages public from associating in the investigation of any criminal case. Justice Sunita Gupta made this observation while dismissing the appeal against conviction under NDPS Act. On Wednesday, the High Court refused to interfere with the Competition Commission of India’s investigation into Ericsson’s alleged anti-competition practices, pertaining to enforcement of its standard essential patents (SEPs) against several Indian Smartphone manufacturers. A Division Bench of the Court on Friday, stayed the Central Government Notifications dated 01.03.2016 by which Service Tax was introduced on Senior Lawyers. Ministry of Finance has recently notified the Service Tax (Amendment) Rules, 2016, based on Union Budget 2016 . Gujarat High Court held that a Court cannot direct the sanctioning authority to reconsider the issue of grant of sanction. Justice J.B. Pardiwala allowed a special criminal application filed by a Policeman accused of Police Inspector accused of demanding illegal gratification, seeking to quash the order wherein the Sessions Judge rejected the report filed by the A.C.B. under Section 169 of the Code of Criminal Procedure, 1973, and proceeded to take cognizance against the petitioner for the offence punishable under Sections 7, 12, 13(1)(d) and 13(2) of the Prevention of Corruption Act, 1988. A division bench of Kerala High Court ruled that visitation rights of the grandparents towards their grandchildren is well recognized and the same also would certainly include overnight custody for shorter periods. The High Court of Kerala on Monday ruled that the consent of a spouse is not a statutory requirement, for making organ donation in case of transplantation amongst non-related persons. Justice V. Chitambaresh of Kerala High Court on Thursday held that the practice of insisting a student to undertake the entire examinations for a mere failure in a single theory / practical exam is unreasonable and arbitrary. 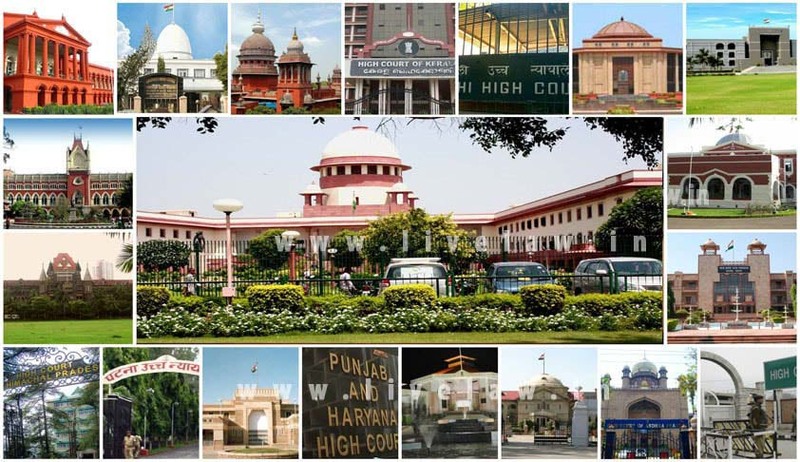 The Punjab & Haryana high Court issued notice on the Public Interest Litigation challenging system of designation of Advocates as Senior Advocates by the Court. The Petition filed by Mr. Arjun Sheoran, challenges the Rules framed in this regard, as being violative of Article 14, 19 and 21 of the Constitution of India. A division bench of Uttarakhand High Court on Wednesday, stayed the operation of the Single Bench order directing floor test for the Harish Rawat government, till 7th April, 2016. Yesterday Justice U.C. Dhyani had directed the floor test in the Assembly on March 31. The Court on Friday directed the Centre to respond to a writ petition filed by deposed CM Harish Rawat and Indira Hridayesh challenging promulgation of a central ordinance by the Union government on the appropriation bill, a consolidated legislation on the state’s annual budget which was declared passed by the state assembly.